Even if you have various other performances of these works I confidently recommend that you get this bargain price disc. OK, these are oldish recordings but they sound good. Madetoja should be a draw for all Sibelians and Klami enthusiasts. He is like and unlike both composers. He studied with Sibelius 1908-10 and his Second Symphony has a Sibelian air though tending more towards the Tchaikovsky-end than the quasi-minimalist northern fastnesses of The Bard and Luonnotar. He has Klami's feeling for woodwind writing (listen to 4.13 onwards in the andante of the symphony). These recordings are drawn from the Finlandia catalogue and collectors who have been in this beautiful game for years will recognise them and may well have earlier LP or CD avatars. The competition is from other sets including the complete cycle of three symphonies from both Finlandia and Chandos (Petri Sakari, Iceland SO). 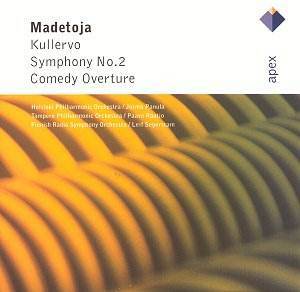 If the Comedy Overture is lithely and cleanly turned without padding, Kullervo, while just as tightly formed, is more intense and Tchaikovskian. The Comedy Overture has economic classical virtue on its side and goes better than I have heard it in any other recording. It could have gone with more zip than it has here but it is played in a lively style allying it with John Foulds' delightfully flouncy overture Le Cabaret (to be heard on Lyrita Recorded Edition - from Harold Moores in London). The Tampere PO/Rautio recording of the Second Symphony was the version through which I first encountered the work in about 1982. It was through the kindness of Mark Lehman (to whom I owe so much of my musical knowledge) that I had a cassette copy of the original LP. In the case of this work it was love at first hearing. No performance since then (and I have heard several including radio relays) has improved on that first meeting. Surely no-one can be immune to the opening of the symphony with its almost tangible suggestion of a Finnish lakeside, aestival warmth and dragonflies floating lazily past. The tune which Madetoja uses seems to breathe and stretch and extend endlessly. Rautio shapes it lovingly and does not go for point-making - letting it speak without 'exegesis'. Once you hear this theme you will not be able to get it out of your head nor would you want to. It also has the potential to be developed dramatically. The idyllic side is contrasted with the tragic in the finale which is inflected with the war years. If you need some 'waymarkers' then think of Sibelius 1, 2 and 3 and Tchaikovsky 5. This is highly romantic music which is not to say sloppy or meretricious. None of his other works have the slippery beauty of this piece. The Third Symphony seems positively desiccated by comparison. The First Symphony is very good in an early Sibelian style but lacks the obstinately lissom qualities of the Second. Do try it anyway but after this APEX disc which has an outright recommendation from me. Notes are brief, succinct and perfectly acceptable.